Our Regeneration and Intensification round table breakfast brought together some of the most influential voices from across the sector to discuss the opportunities and challenges presented by the New London Plan, the most ambitious and far-reaching document to affect planning policy in London for a decade. This week the Chancellor unveiled the Budget 2018, a new SBA for commercial developments and abolishment of stamp duty for first-time buyers of shared-ownership homes. Oliver Lowrie, director at Ackroyd Lowrie comments on the principal changes and what the property industry can expect from them. Ackroyd Lowrie host Regeneration and Intensification round table breakfast focusing on the New London Plan. At Ackroyd Lowrie, we aim to be at the cutting edge of designing the cities of the future. Intensification with Imagination was an event bringing together experts looking at how the New London Plan encourages the development of London’s Industrial sites to create dynamic, mixed-use neighbourhoods where industry, culture and residential uses sit side by side. Ackroyd Lowrie have teamed up with a professional site sourcing company to offer our clients exclusive deals direct to vendors. We have an excellent selection of sites across London and the South East, both un-consented and consented. Ackroyd Lowrie were featured in Forbes Magazine this weekend, discussing how the steep challenges of the housing crisis can only be solved through the innovative application of technology like VR, especially when leveraged as part of offsite construction. Join the Ackroyd Lowrie team on 20th June at The Crypt on the Green EC1R 0EA from 6:30pm onwards for a discussion on the opportunities contained within the new London Plan. Ackroyd Lowrie are out in MIPIM. Get in touch for a meeting! Explore the potential of digital construction and understand how best to implement it into your offsite construction strategy. How will the Government meet its pledge to deliver one million new homes by the end of 2020? Even as investment is ramped up the construction industry must overcome low productivity, uncertainty and a chronic skills shortage that could become critical if the UK triggers a hard Brexit. New Whitepaper: Can offsite, volumetric construction solve the housing crisis? 2018 is poised to be the year that offsite volumetric housing really takes off. Download your free copy of ‘Can Offsite, Volumetric Construction Solve the Housing Crisis’ here. Ackroyd Lowrie host ‘Hacking the Housing Crisis: An evening dedicated to innovative solutions that will transform the property sector. Ackroyd Lowrie hosted an evening of fascinating debate about how we could ’hack’ the current shortage of homes for Londoners. The evening was chaired by Liz Peace, Head of the Old Oak Common + Park Royal Redevelopment Corporation, and featured a panel of experts from across the construction and property sector. Ackroyd Lowrie are bringing property industry professionals together at their next event on November 30th, to discuss innovation in the supply of housing. Discussions will be led by a panel of leading figureheads of the UK property industry. Ackroyd Lowrie have won the award for Best use of Innovation for their work with Virtual Reality. We have developed a process for using the VR technology as a design and testing tool and allow all our clients to have a Virtual Reality sign off before construction starts. Ackroyd Lowrie nominated for Innovation award for our work with Virtual Reality to improve the design process. 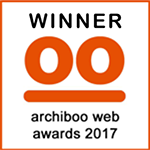 Ackroyd Lowrie have been nominated for an Innovation award at the Archiboo Web Awards 2017 for our work with Virtual Reality to improve the design and production of buildings for our clients. Ackroyd Lowrie are celebrating the launch of our new party wall service, which is tailored specifically to cater for the needs of Architects. What does the future of the construction industry look like? Oliver Lowrie has written a short essay for RIBA President Jane Duncan's latest publication 'Retropioneers: Architecture Redefined'. Thank you to everyone who attended our Breakfast On The Terrace event at The Aviary, London. Many thanks in particular to our event partners Valore Real Estate and Dockley London Property. We hope you enjoyed the morning as much as we did, and that we see you all again at our next event. Over 840 professionals from across the property and construction sectors raced and raised money for Britain's young homeless at yesterday’s 21st annual LandAid 10K. Competition was fierce as runners raced to smash personal bests and course records. Ackroyd Lowrie has submitted Planning for a contemporary housing scheme in a backland site within the Ewell Road Conservation Area. The dynamic form relates to the traditional bay forms of the Victorian villas that surround the site.